Warrior Trail began in 2007 as the first company to design, manufacture, and sell non-ballistic training body armor that enables military and law enforcement professionals to realistically “Train Like You Fight” ® ….. at a Fraction of the Cost. 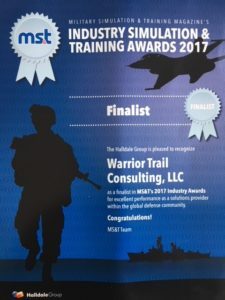 In 2015 Warrior Trail was selected as one of Military Training Technology Magazine’s Top Simulation and Training Companies. The list features companies from around the world that have made a significant impact on military training and simulation industries across a vast array of technologies. 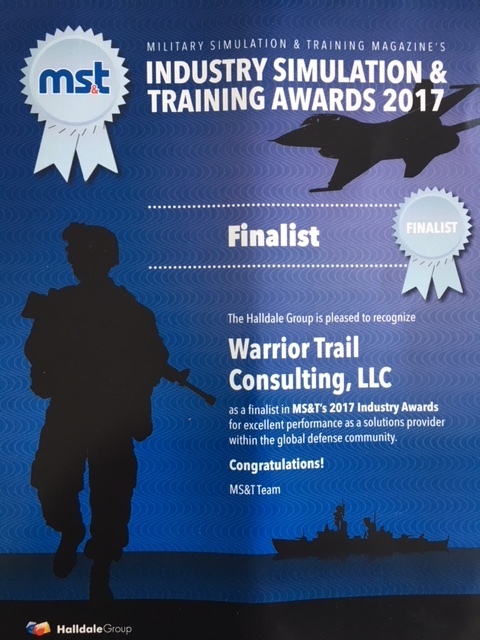 In 2017 Warrior Trail was selected by Military Simulation and Training Magazine’s Industry Simulation & Training Awards as a “Finalist” for Excellent Performance as a Solutions Provider within the Global Defense Community. Warrior Trail remains the only manufacturer of non-ballistic training ESAPI plates and BALCS-style soft body armor training panels that replicate the size, weight, shape and flexibility of expensive DuPont™ Kevlar® ballistic panels. Each of our patented training body armor products allows military professionals, law enforcement and first responders to “Train Like You Fight ®” at a fraction of the cost. Warrior Trail training products provide the perfect solution for all military combat training including the United States Army and Marine Corps, The USMC Crucible, Special Operations training, Ranger Training, Jungle Warfare and Maritime training, the US military academies such as West Point and Annapolis, ROTC, all military services basic and advanced training, and The National Training Centers (NTC and JRTC). Warrior Trail products are rugged, washable, submersible, re-usable, and recyclable. Warrior Trail training body armor components allow you to “Train Like You Fight ®” while preserving expensive, fragile ballistic body armor for your critical operations. Warrior Trail is constantly innovating and adding new products. By using state-of-the-art Polyvinylchloride materials and advanced design processes, has the engineering, prototyping, and manufacturing capabilities to provide training replicas for most ballistic body armor components you may require. Our new low-visibility Law Enforcement and Maritime training vests and inserts, and our new 10×12 SAPI plate that weighs 6.5 pounds were recently deployed. Warrior Trail training body armor products are Export Administration Regulation exempt (EAR99). Warrior Trail products are compliant with US State Department International Traffic in Arms Regulations (ITAR) and are authorized by the US Government for shipment and use overseas. The perfect solution for joint training with allied and partnership forces. Warrior Trail non-ballistic training plates and soft body armor insert panels are patent protected by the US Patent and Trademark Office (USPTO). “Train Like You Fight ®” is a Warrior Trail Registered Trademark with the USPTO. All Warrior Trail products are Berry Amendment compliant and manufactured in the USA. Warrior Trail continues to innovate. We have established a partnership with ShotStop Ballistics, LLC to offer their advanced technology ultra light ballistic plates that are lighter, stronger, and more affordable. ShotStop’s industry leading National Institute of Justice Level III (NIJ 0101.06 compliant) Ballistic Body Armor Plates are multi-hit, standalone, and 100% Polyethylene with a polyurea covering to provide added ruggedness and enhanced durability. Each plate is manufactured using patented Duritium ® technology to provide one of the market’s lowest areal densities with positive buoyancy. All ShotStop products are patent protected and made in the USA.